At Accent Lighting in Wichita, we field a lot of questions regarding lighting design, and there’s nothing we love more than helping a customer find the perfect fixture options. We’ve helped many people redesign and update their homes with new lighting, and if you’re interested in adding new lights to certain rooms, then please visit our showroom today! 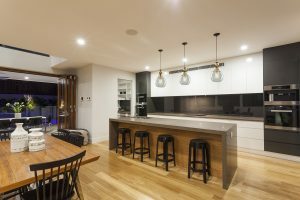 One type of lighting that is commonly requested is pendant lighting, but some customers aren’t sure how best to integrate these fixtures into their home. A common spot for pendants is the kitchen island, but there are other areas where these fixtures can also prove effective. If your home has a rec room, or “man cave,” then there’s a good chance there’s a bar area in the space. When friends come over to watch the game, you want to be able to serve everyone their favorite beverage. Pendants over your bartop can create the perfect ambience for any gathering, and you can pick a fixture style that matches the woodwork and decor in the room. The counter will be illuminated, and you can set the pendant illumination levels by adding the right lighting controls. You may have always dreamed of having a grand chandelier in your entryway, but unfortunately, the dimensions of your front hallway don’t allow for such a large fixture. However, you can hang a larger pendant in the space and achieve the same look as you could with a chandelier. You’ll want to be sure that the foyer ceiling is high enough to allow for a hanging fixture, and if so, we’ll gladly help you find the appropriate fixture. Pendants may not function so well as central ceiling fixtures in a bedroom, but they can serve as an alternative to traditional bedside lamps. A mini pendant can hang from the ceiling on either side of the bed and provide plenty of light for reading before bed. It’s important to keep in mind that pendants will be permanent fixtures that are wired into the ceiling, and won’t be movable like a bedside lamps that plugs into an outlet. Still, they can be a great design choice! If your home has a few special nooks where you like to sit and read, or that are the perfect spot for a unique piece of decor, then a single pendant can be a great way to illuminate the space. If you’re going to sit and read in your favorite chair, then make sure that the light isn’t directly above your head, otherwise you’ll cast a shadow on every page or screen that you’re reading. For tall, narrow nooks, consider placing a long, suspended pendant that accentuates the architecture of the space and highlights any decor that’s sitting there. Pendant lighting can be a versatile choice for many homes, and as you can see, it can used in many different places. Come to Accent Lighting in Wichita today to find new pendants that fit your design.